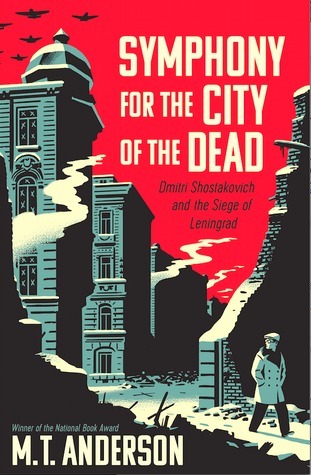 Symphony for the City of the Dead: Dmitri Shostakovich and the Siege of Leningrad by M.T. Anderson. Grades 9+ September 2015, Candlewick Press. 464 pages. Reviewed from egalley provided by publisher. Did you know that the USSR had the highest citizen deaths during World War II of any nation in the world? 27 million Soviet citizens died during WWII, making the Soviet death toll higher than the total deaths of ALL OTHER NATIONS COMBINED. Over a million of those deaths were due to the Siege of Leningrad. Leningrad was the second largest city in Russia and the seat of the Communist Party before WWII started. When the Nazis attacked Russia, they blockaded Leningrad, cutting off supply lines and continually bombing the city. Rather than sending troops in to attack the city, their strategy was to wait it out and let the people of Leningrad slowly starve to death. The Siege lasted 872 days, the longest siege in modern history. And when people had no food, no fuel, no electricity, no way out, and the temperature was sometimes 40 below zero... music was one of the things that kept them alive, that gave them a reason to live. Shostakovich lived through terrible times - the Great Purge of Russia when Stalin could have you executed at a whim - and he wrote music that spoke to the people. Could a symphony be enough to save a city from complete destruction? If you are a person who believes in the power of art to change lives OR if you are fascinated by World War II and are looking for something that's different from other books you've read about it, pick up this book. My thoughts: Holy cats, you guys. THIS BOOK. It was recommended to me by once of my 2015 Newbery Committee colleagues and I am SO GLAD she did because I might not have picked it up and then I would be missing out. This book is a masterpiece. There, I said it. It's at once a fascinating biography, a testament to the power of music, and a riveting WWII story. I just want to talk about the horrors of WWII Leningrad all the time (which makes me really fun at parties). But seriously, there was so much to this story that I didn't know. The one negative GoodReads review that I read of this title claimed that there would be no audience for this book. I agree that it's an ambitious book and one that might be intimidating to teens, who may not know who Shostakovich was (I kind of didn't) or what the Siege of Leningrad was (I definitely didn't). And that's where a good librarian comes in. Hand this to your performing arts kids. The recurring theme about the power of music to give life meaning and to keep people going will speak to these kids. Hand this to your kids who are fascinated with military history and WWII. This may be a WWII story that they don't know much about. As I was reading, I kept thinking about The Family Romanov by Candace Fleming, which may appeal to kids who are interested in reading more about Russian history. Breaking Stalin's Nose by Eugene Yelchin is ostensibly a middle-grade novel, but I actually think it's maybe best suited to kids who have an understanding about Russia and Communism. It's a poignant look inside the pervasive fear that the Communist regime inspired in Soviet citizens. This might be a good choice for teens who devoured Between Shades of Gray by Ruta Sepetys and want to know more about the Russian society that could enact such atrocities.